AOL has released a new version of its AIM instant messenger app designed specifically for Apple’s iPad. AIM for iPad takes full advantage of the device’s new capabilities—especially its larger screen—to offer a different user experience than what you might get from the mobile and desktop editions of the messenger client. 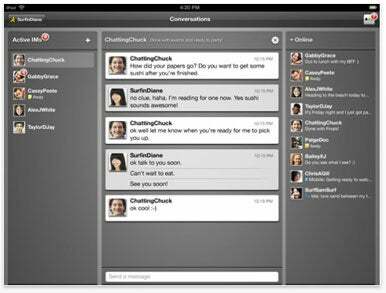 AOL’s iPad app features three different panels: on the left-hand side, you will find a list of the currently open chats—akin to the “Active IMs” screen found on the iPhone and the tabbed interface of the desktop version. In the middle sits your current chat—which supports both text and pictures. Finally, the right-hand side of the screen shows a list of your buddies. As is the case with other incarnations of AIM, you can communicate with people through Facebook, ICQ and MobileMe and, under some circumstances, SMS. AIM for iPad can also interface with AOL’s “LifeStream,” where you can post updates and pictures while monitoring what’s going on in the lives of your friends and colleagues who also use the social media system. AIM for iPad is a free download from the App Store; it requires an iPad running iPhone OS 3.2 or higher. Unlike the iPhone and iPod touch version, there’s no premium version of AOL’s iPad messenger offering.